Shark cage diving is not only an extreme sport for adrenaline junkies but allows us to come up close to sharks in their natural habitat so that we can understand them better. Although sharks are one of the world’s most dangerous predators and it’s easy to imagine them at their scariest, sharks are also graceful and majestic sea creatures that have an important role to play in the environment. Shark cage diving offers the opportunity for us to witness sharks in their own territory and to come closer to acknowledging that there is more to these animals than meets the eye. Sharks are probably one of the most misunderstood predators. But without sharks the sea would be overpopulated with seals and fish, resulting in an unbalanced eco-system: sharks are carnivorous, one of the main factors leading to their formidable reputations as some sharks such as Tiger Sharks will eat almost anything. One of the world’s largest Great White Shark populations can be found in Cape Town, due to the abundance of seals that live on Seal Island and by Shark Alley in Gansbaai. The seals leave the island to feed in the waters however whilst doing so, many are preyed on by sharks. If there wasn’t a large shark population along the coastline, eventually there would be an overpopulation of seals and not enough fish to feed them. Great White Sharks are roaming animals and new sharks are seen in the waters of the cape every day. The sharks travel vast distances to feed and breed but there is still an abundance of information to learn about these apex predators. It has been argued that shark cage diving encourages sharks to hunt and feed on humans as diving companies that go into the waters throw fish and chum into the ocean to entice the sharks to come closer, it has been debated that sharks will learn to associate humans with being fed. Fortunately as mentioned Great White Sharks are roaming animals and do not stay in one particular area for a lifetime or even a long period of time. Great White Sharks have been tagged in the Cape in the past were spotted moving up the east coast of Africa only weeks after being tagged in Cape Town. One famous shark (Nicole) was tagged in Gansbaai and after 99 days made it to Australia. If Great White Sharks were territorial and resident in one place then there may be cause for concern but thankfully they are not. For a very long time Great White Sharks have been coming up to fishing boats as all fishing boats are basically baiting. There is no difference between the fishing boats and shark cage diving boats from baiting except that the shark boats are there to observe nature and the environment and educate people. 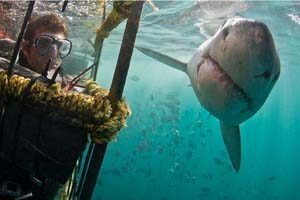 Shark Cage diving has allowed researchers and documenters to come up close to sharks whilst remaining safe from their fierce jaws. Safely behind bars in steel cages, they have been able to make recordings and watch how sharks behave when they are in their own territory. False Bay and Gansbaai have become a hot spot for photographers and documenters over the last decades as the shark population is large; incredible photographs and footage have been taken of sharks breeching and hunting their prey. Lastly, shark cage diving invites tourists and locals to get a different perspective of sharks. Without a doubt the experience will give you an adrenaline rush, but it will also allow you to repel the fears and misconceptions about sharks, and will give you an opportunity to have an inside look on how sharks behave underwater.